Okay so here it is--my very first tutorial. Try not to judge me too harshly. Ever since I made my round 11 quilt for the Doll Quilt Swap I've had quite a few people as me for a tutorial or pattern for it. Well I didn't have one--I just figured it out on the fly. But I thought this might be a good way for me to cut my teeth as far as tutorials go, so here you have it. First of all some notes. All seams are 1/4". This tutorial is for a doll-sized quilt since most inquiries were about that size, but it could easily be translated into bigger blocks for a real quilt. Okay, here we go! Okay, now you need to cut your fabric. 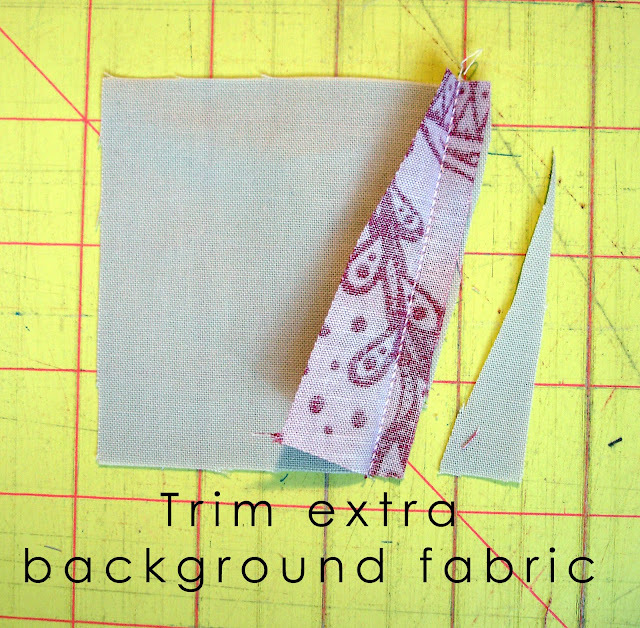 You will need to cut your background fabric into 42 3.5" squares. 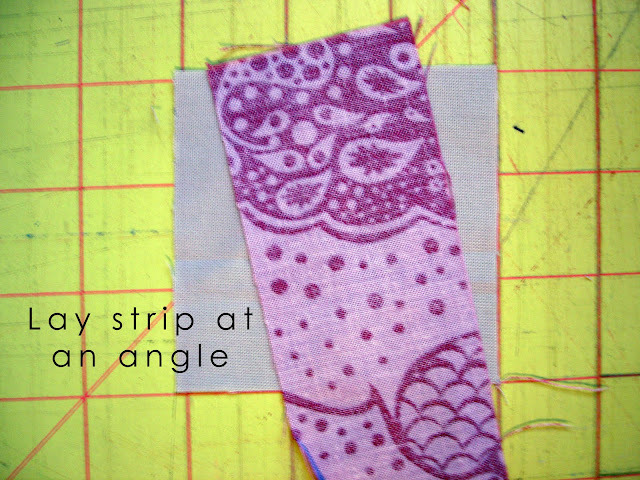 Next, cut the zig-zag fabric into 2" strips. I used Kona Ash for the background and some Good Folks scraps I've been hoarding for awhile now. The strips were various lengths but I found I didn't need much--a fat quarter of each fabric will leave you with LOTS of extra fabric. All cut out? Good. You're ready to sew. Lay a strip of patterned fabric across the background fabric at a diagonal. The exact angle isn't important, especially if you're going for a wonky look. 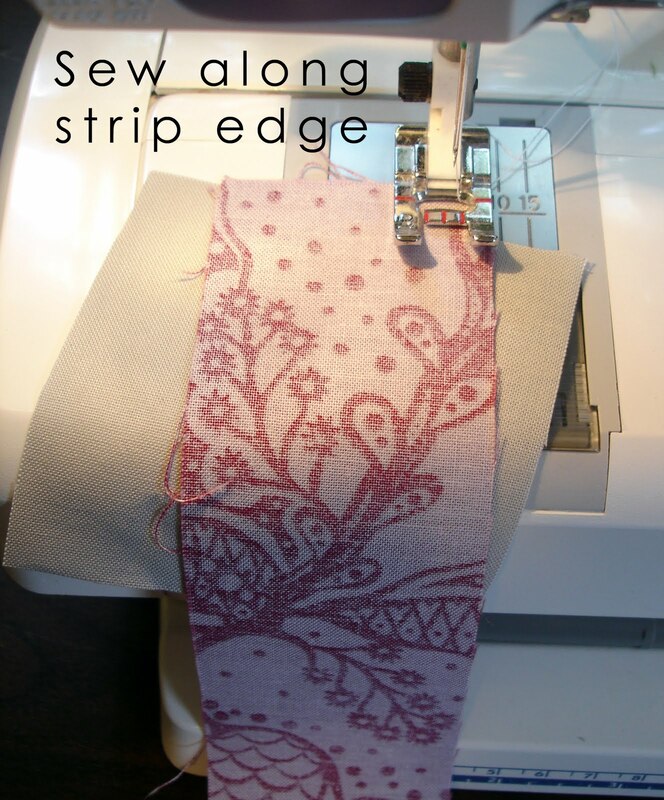 Set your machine for a quarter inch stitch, and line your presser foot up with the edge of the patterned fabric. 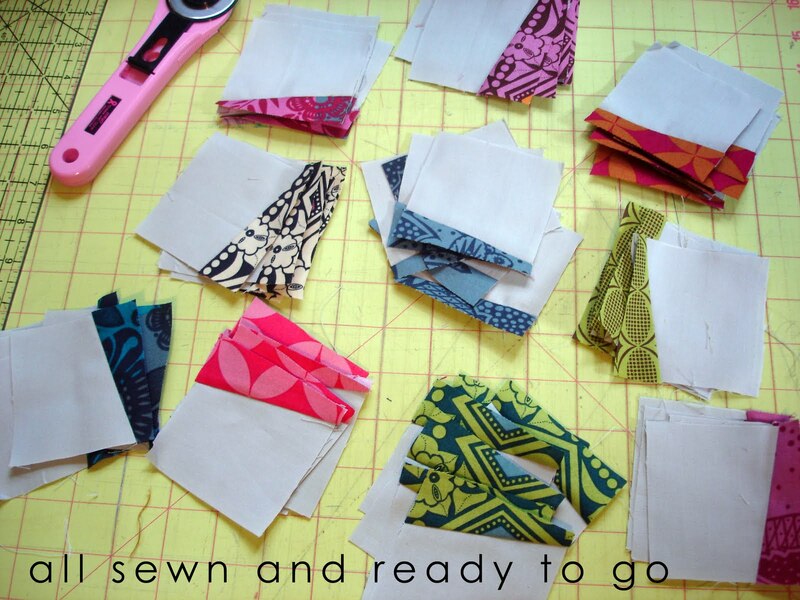 Sew, sew, sew. 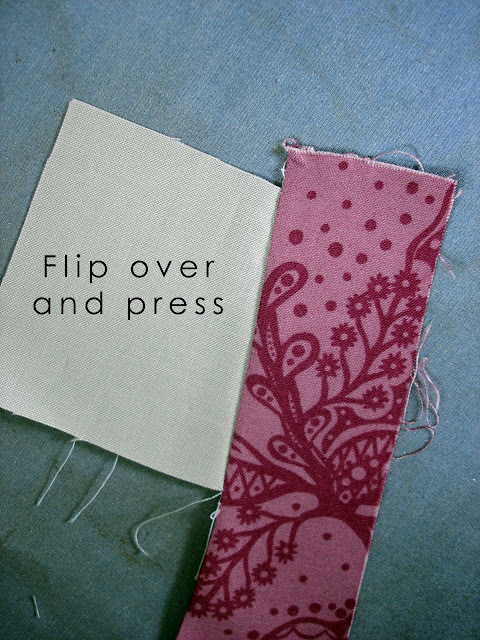 Flip the fabric over and press. 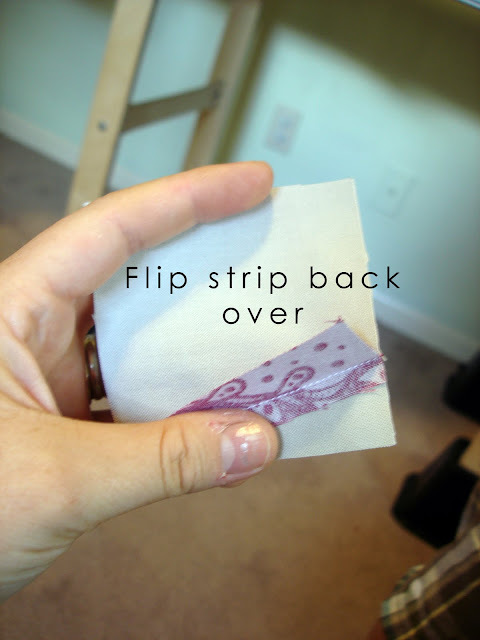 Note--you will need to press the seams so that the strip is folded over, not the backing. You will need the square to stay square for a little while longer. See what I mean about the square? Okay good. Now keep it flipped over. Now it's time to trim the excess strip fabric away. 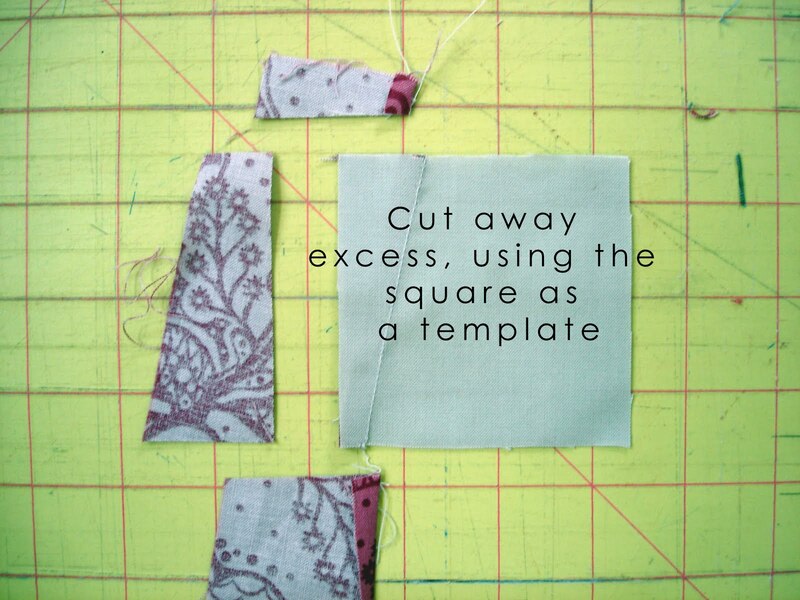 Using the square as the template, cut along the edges. Flip it over and check it out!! ...and do what the picture tells you to. Now, repeat the process 41 more times. This doesn't take as long as you'd think, especially if you chain piece. Tada! You're done! Now you're ready to quilt and bind, baby. Hope you like this, let me know if you all have any suggestions! Thank you ! I love your DQS11 quilt, now I can make my own. Your tutorial is lovely, clear and easy to understand and very good pictures. great tute, and it was easy to follow. super cute little quiltie. definitely will be doing one of these. thanks! Great little tutorial -- good pictures and good directions. :) Thanks! Thank you! Love your DQ and I am so excited you posted the tutorial! New follower! Ta da! A great tutorial. Clear, fun and lots of pictures. Doesn't hurt that I love the fabrics too. Thank you so much for this! I love it!! Fabulous! Makes me want to stay up all night playing with my scrap drawer... but I'll be "good" and hold off until the WIP/UFOs bin isn't quite so full. Oh my goodness, you are a genius!! I have been going crazy over your first doll quilt, and now I know how to make one!! EPPPP!! I'm squealing here :) Thanks so much- love this!! I love the tutorial, too (as all those who left a comment before me ;)) It's both easy to understand and fun. Thank you so much for sharing. Yay yay and thank you, thank you. I'm gonna try that in the 5 inches squares instead of your 3.5 inches squares. I love,love, love this quilt. I first saw it over at "In Color Order" yesterday and had to make one. If you want you can see mine here. Great tutorial. I'd love to make this once I've collected enough scraps. What a cute quilt! Thanks for the easy tutorial. Hi Jen, Great quilt and tute. do you think this could be done as a stack and slash with an alternate colourway quilt being made? (white zigzags instead of coloured?) Two for the price of one! Thank you so much for this tutorial. You make it look so easy I might actually try to make this one. I just ran across your blog and this tute for the Lightening Zigzags and had to say how awesome this is. Thank you. I just found your blog site. Don't ask me how. I started out at a blogsite that you can put in your state and find all the bloggers there (that are listed). Somehow, I went to one blogsite, then another, and another, and after about an hour I found you. And I am so grateful to find you. 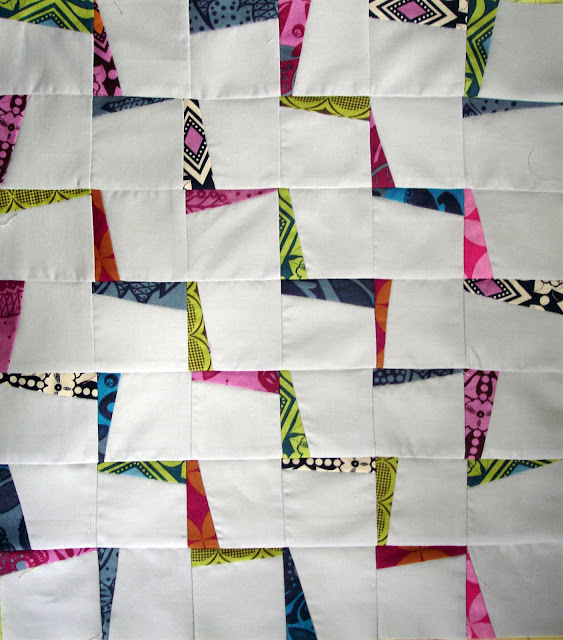 I LOVE, ADORE, ADMIRE your zigzag quilt. It's so simple but looks amazing. Thank you for the step by step instructions (including the pics which I need because I am visual) so I can now make one of my own. I like this so much I've been spending the first few days of the new year working on one of my own in shades of gray and orange. I'll link back to you when I post the finished quilt on my own blog. Thank you so much for sharing, what a great tutorial! Wonderful!! I have to run to the sewing room and make some blocks!! very good job! I love this wonky block! Looks good! I can't wait to try this one out. Love the tutorial! 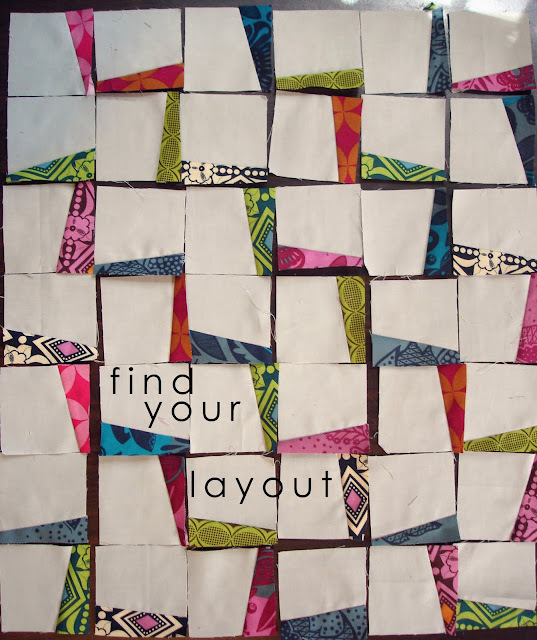 Here is a link to my mini quilt using your tutorial. Love this! So cute and fun! I had to pin it for later. Thank You!!!! This looks like fun!!! I hope I can make one someday!!!! I love this. I've made some pieced quilting squares, but this one is soooo easy! The tute was so clear and concise. Good job. I can't wait to try it. Thanks for the tutorial...wonderful job. I LOOOOOOOVE it!!! This is on my to-do list, for sure. Thank you, thank you, thank you. So very clever!! I losve the quilt. Your instructions are very easy to follow. I will try using left over jeans for the background. I can't wait to get started!! I just found this via another pinner on Pinterest. Really cool! I am in need of a quilt pattern for a baby boy who isn't born yet but due in February 2012. I have the "fabric" that consists of old flannel pajamas in various patterns that belong to the Grandma to be. She only wants something big enough that the baby(when he's older of course) can drag around with him. This pattern looks fun and relatively easy. 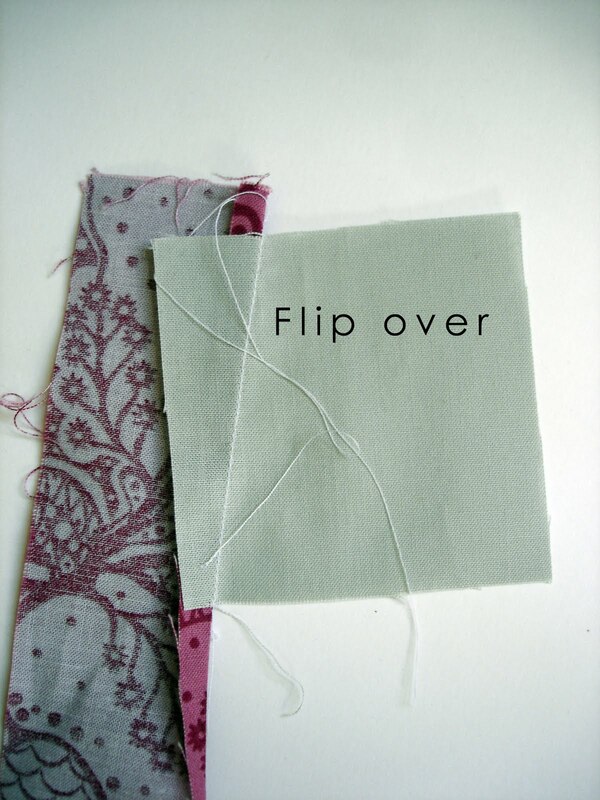 Do you think this would be fun and simple enough for a relatively new quilter? I'd greatly appreciate the feedback! Your tutorial was very clear. However, my layout differs from yours as I was consistent with my wide end/narrow end up/down, etc on each row, etc. Threw me for a loop when I came back and looked at your finished layout! LOL! Thank you so much for this! I love it! Thank you for this awesome pattern idea. I love how it looks. Going to get my squares cut right now!! Great tutorial. Love the quilt. I'll have to try this one! I plan on making this tonight! Yay for lovely, easy, UNIQUE projects! Thank you for the inspiration! 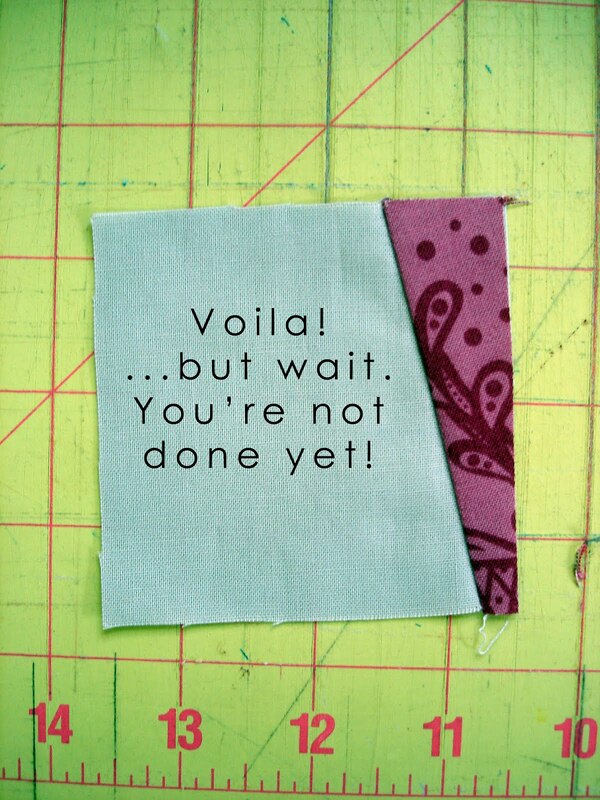 This looks like exactly what I need for the back of a quilt in progress!! I am so excited to find this, thank you! Can't wait to try this! i love this pattern! your directions are fun and clear. am doing this today!! thanks!! Cute quilt! AND you did an excellent job on the tutorial! I'm thinking it may can be done using the printed fabric in place of the white and the white for the lightening. You know anything goes when your quilting. Thank you for sharing. It was a great tutorial, straightforward, simple and the pictures were perfect. The quilt is adorable and your instructions are very clear. Congratulations on your first tutorial. Your instructions say to cut your squares 3.5" but your pictures where the squares are lying on a cutting mat show them to be 3" Did you make two different size quilts? 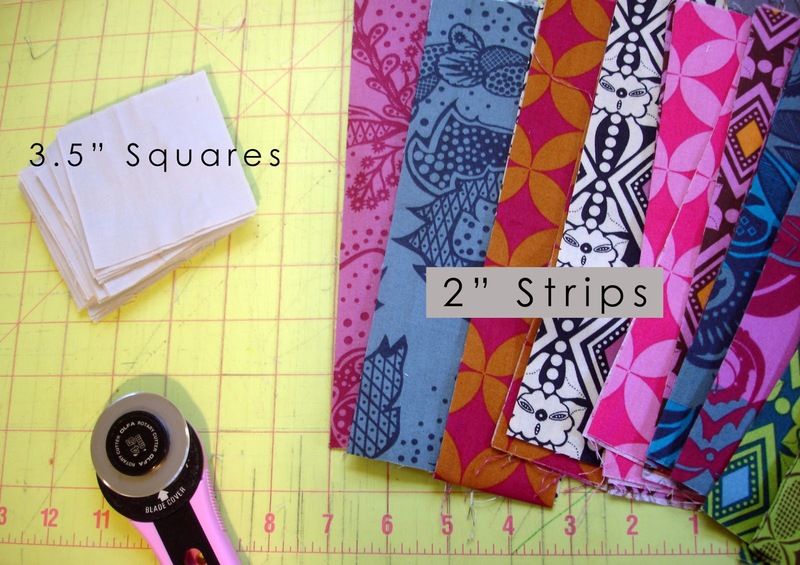 I'm wondering about using 5 or 6" squares ... would I then make a wider strip? or just use the 2" strips still? Finally gotten to point where I can quilt again. 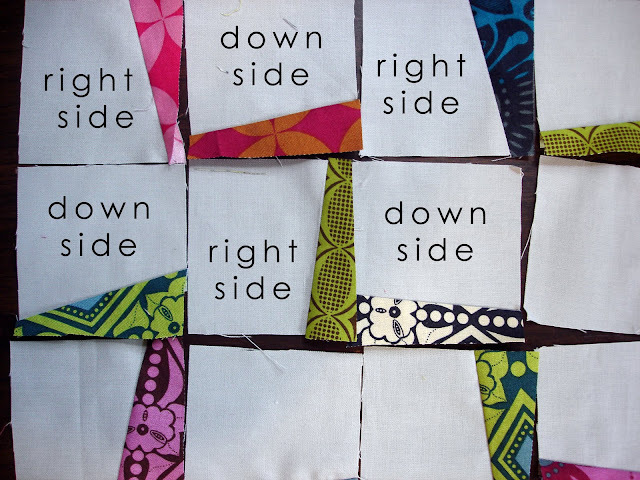 I plan to make single bed quilts with this great pattern. Has anyone made these blocks for a bed quilt? If someone else has figured the size if the print piece? and how much fabric is needed? I just saw your fantastic tute and am going to make one for the charity treasure chest at mu lqs. They give them to a charity that has a Christmas party for underpriveledged children every year. I try to make seversl doll quilts and turn them in at the beginning of December. Looks like a fun and eat project and I have collected a lot of scraps so I will have a nice varitety to work with. Thank you and Happy 2014. Beautiful quilt, great tutorial (warm and friendly; so encouraging for beginners!, effective pictures, and can be completed quickly - thanks, Jenn! I love it. Can't wait to make one in red, white and blue. Thanks. So excited to try this! Love it!! Be still dust and vacuuming, I've got some sewing to do! Found tute a week ago, thought I could remember it (is easy). Well, couldn't and looked and looked. Finally found again. Now - onward and upword. LOVE this pattern! Thanks SO much. I am thrilled with this pattern. I love that each strip is not exact. I am making a doll quilt for my granddaughter and one for her bed too. I think I will use 6 inch squares for that. Good tutorial, directions and pictures. I think this might be very interesting using a design block with solid "flashes". Just a thought. Hope I can find the time to try this. Really cute. I like it a lot. I LOVE it! I wish I'd seen it when you posted it, but thank goodness AQS linked it. 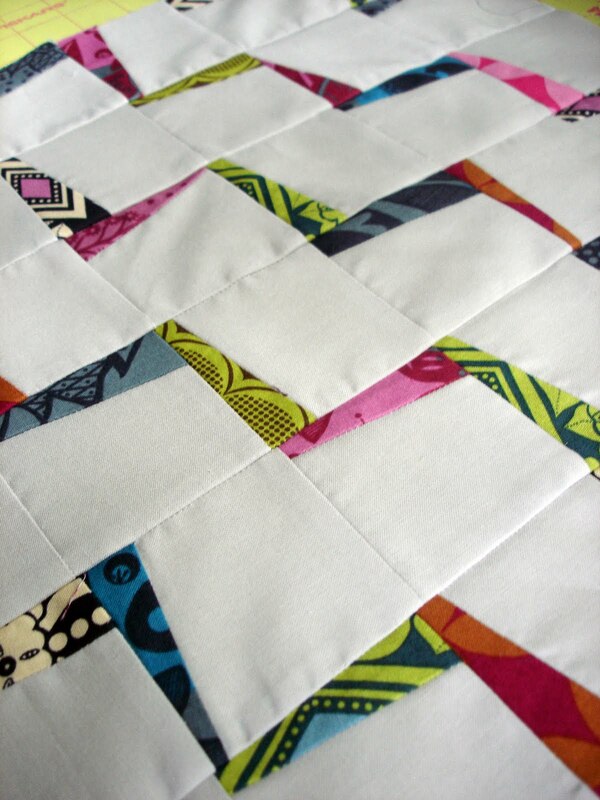 This is a fabulous scrappy quilt! Thank you so much for this tuto!!! wonderful tutorial! clear pictures, simple didrections. super easy to put together quilt. thanks! Thank you for your wonderful idea's. Cute quilt, I want to try this soon. Great tutorial and what a cute block! Thanks for sharing this with the rest of us. I was so inspired by your tutorial, that I made a quilt! I'm trying to include some pictures but not able to. Thanks for posting. Loving this. You did awesome. A musty. Love this pattern and cutting into my favourite coloured material for it but wondered if I am being a bit dense over what side the coloured material is sewn. I took the tutorial to mean that I should sew the scraps onto the right side of my square wider side at the top but looking at your layout it looks like some of your scraps are sewn narrow side to the top. I have lots of material spare so could produce more blocks but wondered if it really makes a difference. Thanks for such a great pattern and easily understood tutorial. Love it. Am making a baby quilt with blocks a little larger. Love finishing it up so fast. Finally got around to making this after wanting to for so long. But I think I've done something wrong. Were we supposed to sew the colored strips to the white squares in two different directions? I think Debby Mann noticed the same thing--see her comment above. Caught my eye and had to find out more. Luv the tute, very clear and informative. Thanks for your time and imagination. You are truly a gifted person. Excellent tutorial. Clear and the accompanying pictures convey a thousand words. I'm just about halfway through piecing the top. I just noticed that the lightning strips are varied on whether they start with the wide part bottom right or top right. I was doing them all similar. Time to switch it up! Thanks so much for the tutorial. Not everyone can write instructions, but your tutorial with photos is very well done! Congratulations!!! Sewist, Craftist, Bakist, Artist. What? You can't add "ist" to everything? Says who? I'm also an Adjectivist, so I can do what I want. Leave me a comment to let me know you stopped by! I'd love to hear what you think. Email is my friend...click here to send me an email. you remind me of home.